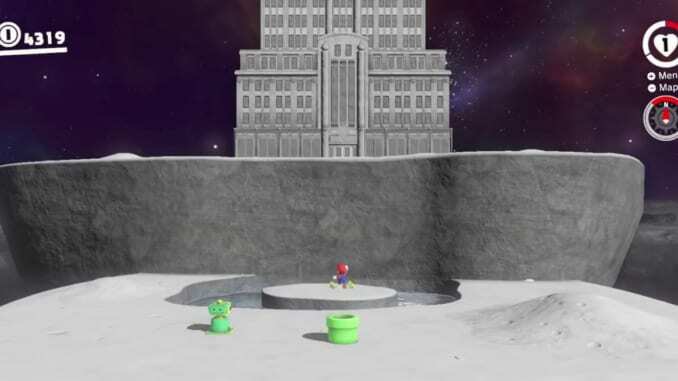 After collecting 500 power moons, players will now have access to the secret final stage of Super Mario Odyssey: the Darker Side Kingdom. 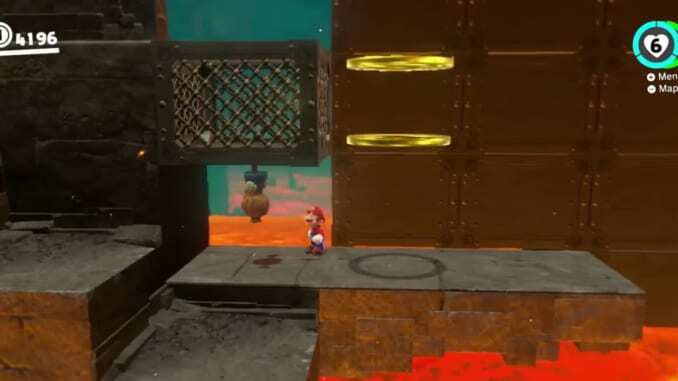 After completing the Dark Side Kingdom, Super Mario Odyssey still has one final stage: Darker Side Kingdom. 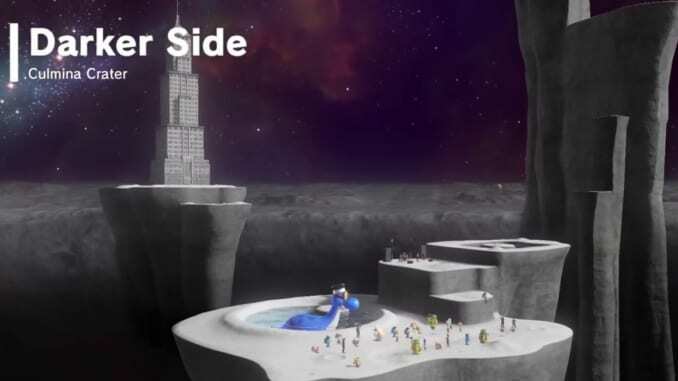 The Darker Side Kingdom is a Super Mario Odyssey Secret Final Stage that unlocks after collecting 500 power moons. After grinding for 500 power moons, players can access the Darker Side Kingdom through the World Map. 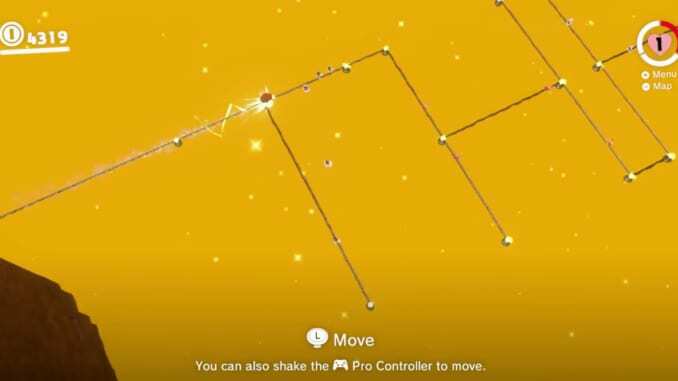 Trying to find an easy way to get those Power Moons? Click here. In the Darker Side Kingdom stage, there are 14 different sections. Unlike the Dark Side Kingdom, you’ll have to accomplish all the tasks with only one life. Hop up the ledges until you find a pond with a frog in it. Capture the frog and hop your way up the platforms. But time your jumps carefully because gravity affects your drop time and that the platform is also moving. Keep hopping your way up until you reach a tube which leads you to the first sub-segment of the Darker Side Kingdom. Once out of the tube, head towards the platforms where you find multiple Goombas. Form the tower quickly while avoiding the bombs that a floating robot hat with chainsaws drops. 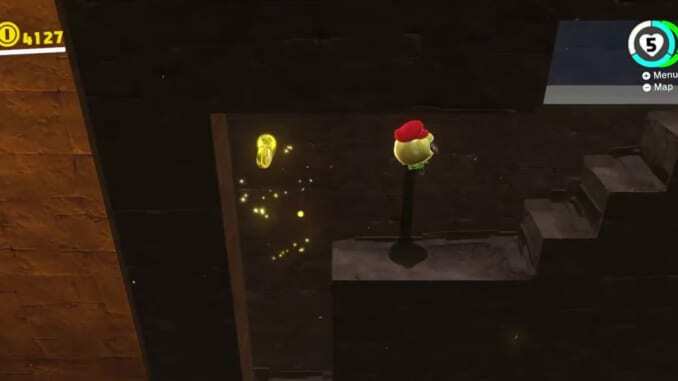 When you form the tower, let go of the Goomba Tower and stomp down the floating robot hat. You’ll have to do this twice before it disappears. After defeating the robot hat, don’t forget to grab the heart that the hat drops. When you’re done, climb up the ledges before stopping near the platforms that are floating over lava. When you reach the lava, you’ll have to jump across. However, the platforms sink down into the lava so time your jumps. One way to navigate is to follow the trail of coins. There’s also a particular kind of wall that doesn’t sink when you scale it which you can use to get a grasp of where you are. After jumping across the lava, jump towards the flag poles. But, watch the three succeeding flag poles. They sink into the lava. Time your swings before making it across to the next permanent flag pole, grabbing the coin rings as you go along. Follow the path until you come across a lava river with ramps flowing towards you. 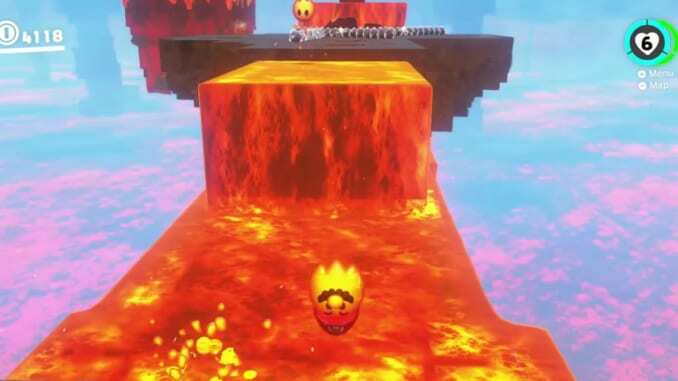 Using the ramps, leap across the lava river until you reach the next platform with three boxes. Pop it for some coins before capturing the fireball to swim across the lava. After that, climb onto the next platform where you’ll notice spinning blockades with multiple pools of lava. 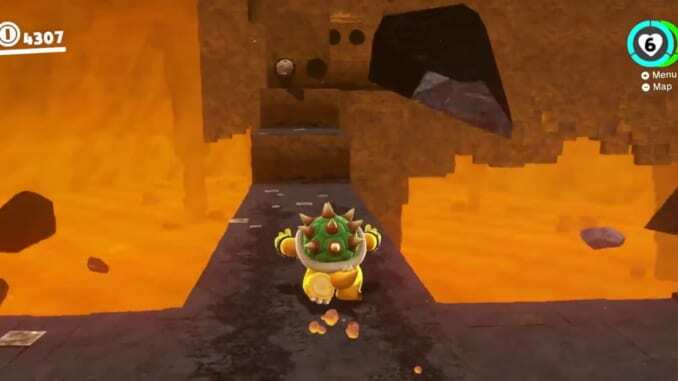 Time your jumps carefully through the lava pools before making your way to the other side which has a cannon. After being fired out of the cannon, you’ll make your way to the next segment which you’ll have to possess an Uproot. Using the Uproot, stretch up to push up panels to create openings to make your way up. Watch out for the other columns as they can shove you off the platform. After following the path, you’ll find a hole in the wall that leads you through a pathway. Follow the pathway before you reach a long trail of bats. However, you’ll also notice that there’s water that you’ll have to swim through. 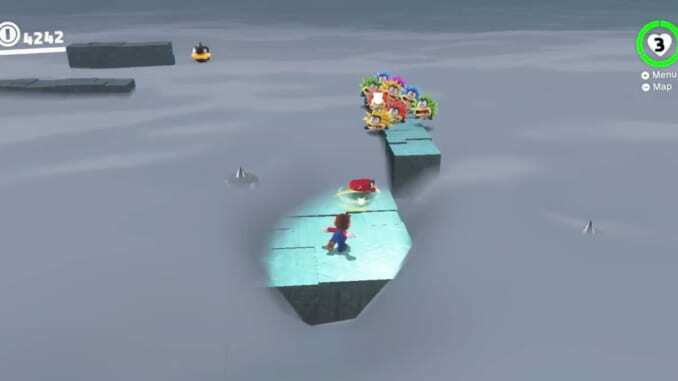 You can use Cappy to hit the bats before swimming through the pathway, making your way to the other side. When you reach the other side, you’ll find a bridge with an egg in the middle of a trail of bats. Time your Cappy throw before shattering the egg to reveal Yoshi. 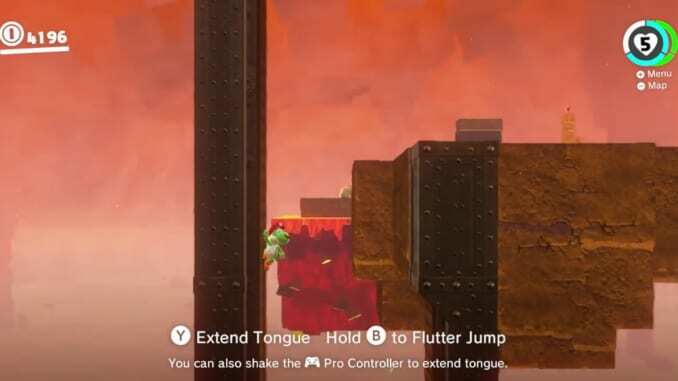 Capture Yoshi and scale up the wall by pressing Y to extend Yoshi’s tongue. Climb up the ascending conveyor belt until you reach another platform. Jump to the next platform and press the blue button to trigger a flower bridge. 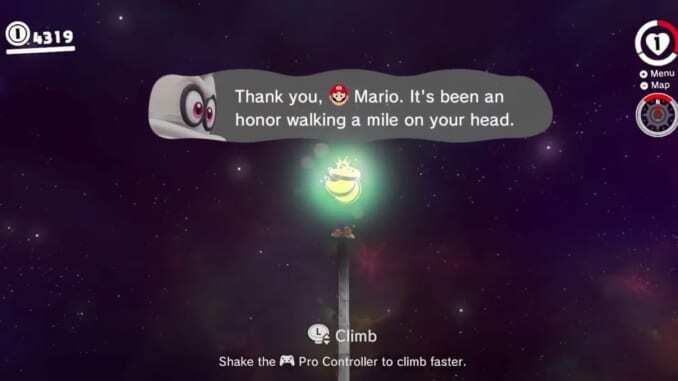 Run across the flower bridge still as Yoshi until you reach three large walls. Leap over them and continue following the Flower Bridge before jumping to a platform with a Sphinx. On your right and at the left of Sphinx, there’s a small hole where you’ll find a Heart to replenish your lifepool. Hit the blue button again before crossing over to the next obstacle of the Darker Side Kingdom. The next segment of the Darker Side Kingdom starts off with capturing a Scarecrow. Once you do, it’ll activate a trap with columns that will push you off. Follow the pathway with Coin Rings, watching out for the columns that could possibly push you off. When you get to the top, you’ll reach the next portion with a Glydon standing at a ledge. Capture the Glydon and glide across the space. Watch out for the mosquito looking creatures while using the updrafts to keep you up in the air. Once you’re across, you’ll see a Green Volbonan on the ground. Flick yourself across the lava using the Volbonan until you reach the tube which marks the end of part one in the Darker Side Kingdom. After taking the tube, you’ll reach the second portion which is a cloud labyrinth. 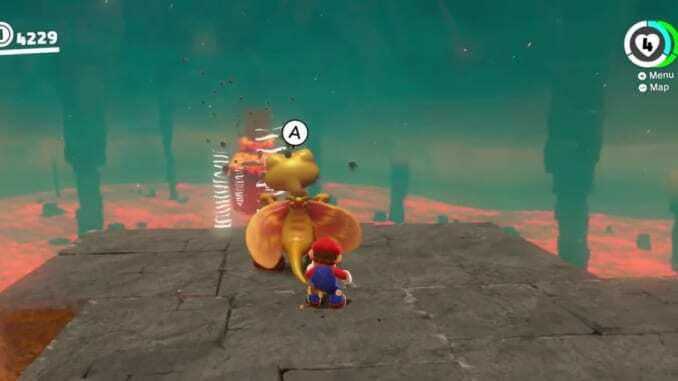 There are multiple bombs lying around which you can use to clear the clouds with Cappy. Ride the moving platform while hitting the enemies off the platform. You can also let them fall off the platform by moving away from them. Another way to defeat them is to use the bombs that are lying around to throw them off. Once you reach the other side, capture the Pokio and climb up the swinging boxes until you reach another tube. Similar to the Donkey Kong Battle, you’ll enter another portion of the map similar to the old Donkey Kong battles. Run around the circle and reach Donkey Kong. Defeat him by popping the four boxes before making your way down the hole. After finishing the Cloud Map, you’ll find yourself in front of Bowser’s painting. Walk towards the painting and make your way through it to move on to the next area. Suddenly, you’ll find yourself looking like Bowser! Make your way towards the breakable walls before following the path. However while going down the path, watch out for the incoming boulders. But as Bowser, you can smash the incoming boulders. After leaping your way through, you’ll find yourself in a narrow path in which boulders will hit you from behind. Claw your way out but don’t forget to destroy the incoming boulders. Once out, jump up the podium but watch out for the boulders. Smash also the breakable boxes to find hidden platforms. When you reach the end, jump down and claim the coin rings to move on to the next portion of the Darker Side Kingdom. Capture the Electric Current and climb up the wire. Once you reach the end, you’ll come across a wire puzzle. When you reach the wire puzzle, follow the pathway to the other side. Once you reach the other side, capture the scarecrow to see your lovely work of art that spells “Thank You”. After that, jump into the tube to make your way to the final portion of the Darker Side Kingdom. Use the binoculars to look at the final part where you’ll have to climb up a building. Use the frog to hop your way up the building. 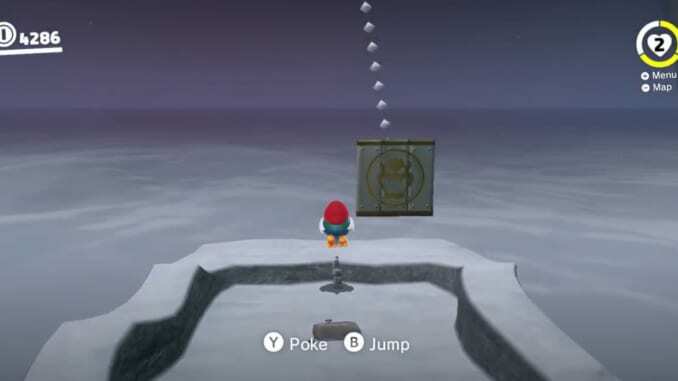 Then climb up the pole all the way up to to get the multi-moon at the top of the pole, marking the end of the Darker Side Kingdom.